With all of the commotion of ports and retro revivals, Capcom have yet again taken notice, producing yet another classic collection of titles for hungry fans to sink their teeth into. Capcom have released the appropriately titled Capcom Beat ‘Em Up Bundle for consoles, attempting to bring past arcade favorites back into the hands of those craving some nostalgia. So how does the addition of online and general fluidity to these old favorites fare today? Let’s find out. Most gamers know a good portion of the tales here, as they feature long-time mainstays for Capcom such as Cody, Guy, and Haggar – who have all appeared several times in titles such as Street Fighter and Marvel vs Capcom. Outside of Final Fight, there honestly is not a whole lot of lore that is known about something like Armored Warriors or Battle Circuit, but honestly – each have about the same objective. Big bad A is kidnapping random B and a set of characters must set out through a selection of stages to save the day. I hate to just group all seven titles in this collection together like that, but its true. 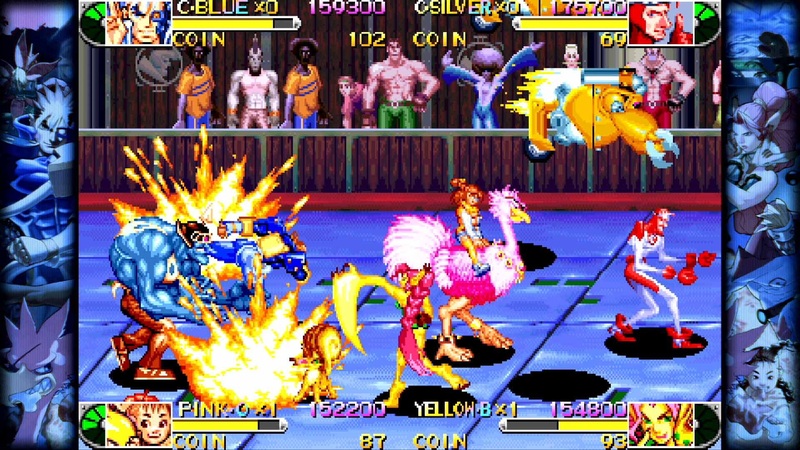 Capcom beat-em-ups all feature very similar plots, so players will mainly be focused on surviving with credits in tow, rather than seeing any kind of epic cutscene in-between stages. Its serviceable storytelling at its finest, simply acting as a minor way to keep the game progressing, acting as a way to make sense of changing environments. I think a lot you also know the general gist of a beat-em-up. 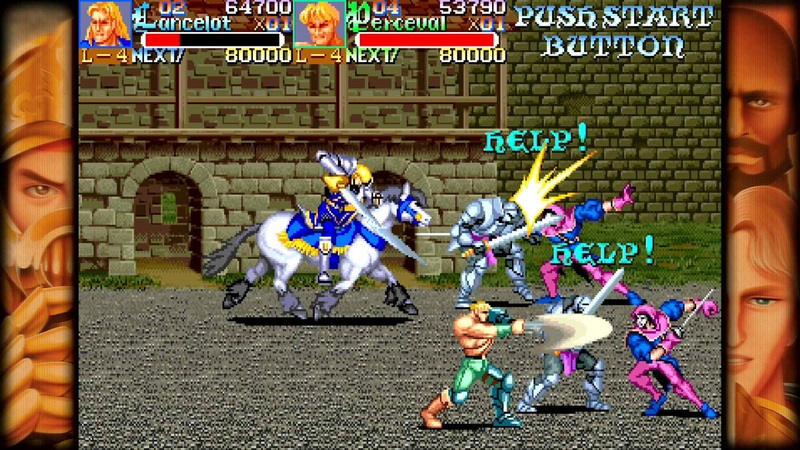 Players move right on a side-scrolling screen and mash buttons to perform attacks, with enemies dropping health and power-ups that keep the adventure progressing. In general, not one title in this collection deviates from that formula, but all definitely offer their own take on the experience. 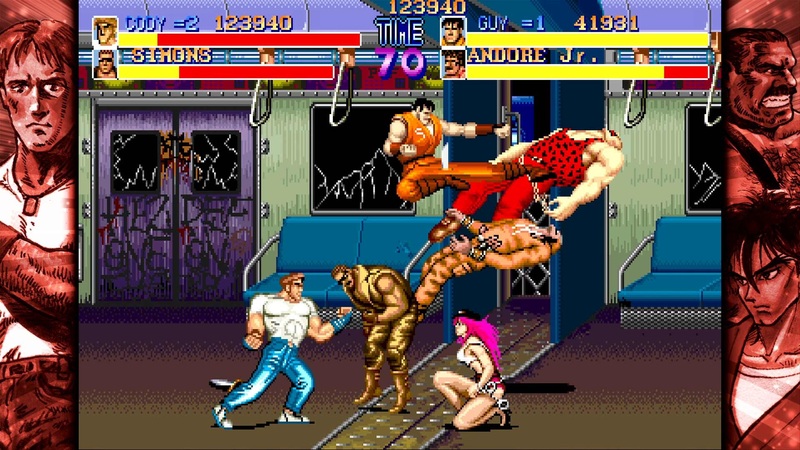 Final Fight is absolutely the most traditional, and in my opinion is closer to something such as Streets of Rage than a lot of other titles within the same collection. Though much more unique, The King Of Dragons and Knights of the Round capture the same feel, but offer an RPG progression system where players can level up and upgrade stats as they push through. 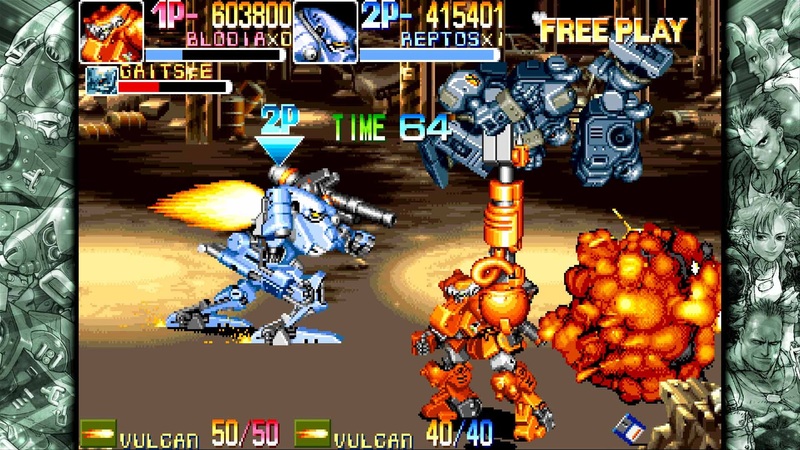 Armored Warriors‘ main features revolve around the mechs within, allowing players a ton of options when it comes to customizing their arsenal. 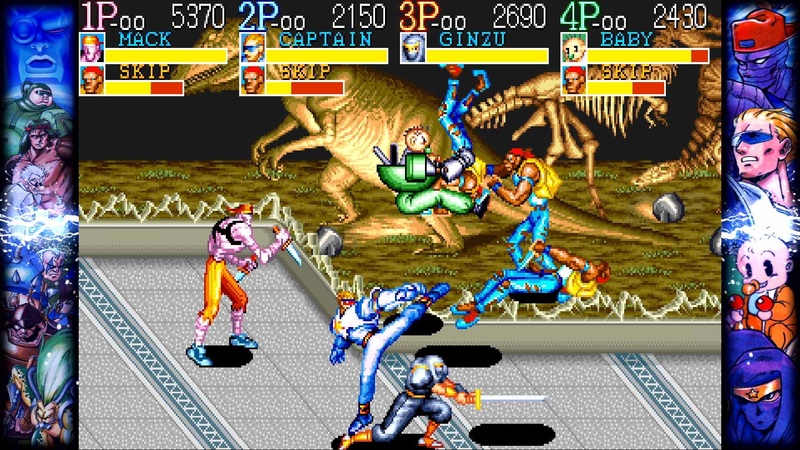 Captain Commando is basically Final Fight with more refinement, and then there is Battle Circuit. I saved Battle Circuit for last as it is the only title in this collection that was actually one I had never tried, so playing something so over-the-top and colorful was definitely exciting. For this romp, techniques are expanded upon and leveled as progression occurs, as this title basically borrows a bit of gimmickry from all of the other fare involved and adds its own insane flare to create an unforgettable experience. The controls are tight, the gameplay is fun, and the story is lovely. The big feature for this collection is the ability to go online and have up to four players drop in and out of combat and complete a game together. Thankfully, the servers seem to be decent enough to pull this off on the Playstation 4. I played each game for a bit online, and I didn’t have a lot of issues aside from players quitting constantly, but thankfully- that does little to harm you unless you don’t like waiting for others to join up. Players can also tailor their experience through the options within, with the ability to fast-forward and rewind the game with a press of a button, with added save states also provided to modernize that classic feel with mechanics that have become the norm with these types of ports. Do I think there could have been some goofy special features or perhaps even a little more love overall for this collection? Sure, but with seven games, anyone should be able to find a preference and run with it as this genre specific pack has a slice of something for everyone. Visually, these games look great in HD. Their bright colors and animations come off as fluid, and despite some loss of frames online (mainly when someone is joining), this collection may be the best way to see these old favorites if you have the itch to go back. Of course some titles come off as a bit muddy and dark due to their setting, but with those titles usually come a lot of brightly colored magic and flashy animations to compensate, breaking up from the boring models and environments that one may tire of easily. Most will find the visuals a preference issue, as each of these titles came out in a different year and some are nearly thirty years old, so do not expect perfection – but do expect for art styles that lack polish but still have the charms of yesterday. Play Final Fight again in its raw form, and you will see what I mean. The sound is awesome. Each title has a highly varied soundtrack that Capcom fans will love and fall right into. Sure, some are less memorable than others, but there is no doubt experiencing this title with the volume up is the way to get the most of that arcade atmosphere. From the sound effects to the rips that expel out as magic is executed, the sound absolutely sounds great, and not one title misses a beat in that area. 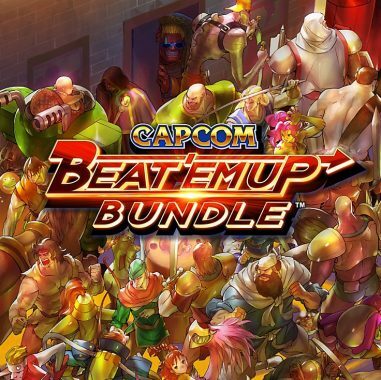 Capcom Beat ‘Em Up Bundle is a lovely collection that offers seven favorites for a discounted price-tag. Could there be more? Of course. I would love to see a bit more fan service and love go into this collection, with more special features and stories from developers. However, what we get here is a nice walk through an arcade with some awesome games that will introduce players to why no kid in the 90’s had lunch money. Genre collections can be hit or miss at times, but this bundle’s variety and quality within will give everyone looking for a nostalgic punch to the heart that they are sure to go back to again and again. No quarters required.